As fall draws near, we are really feeling dark and moody rooms! 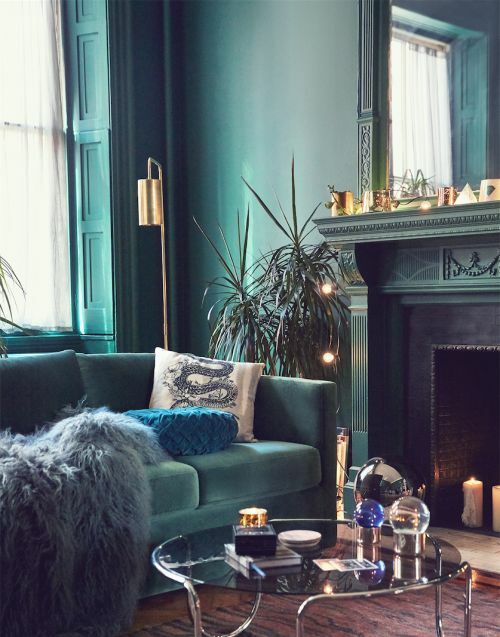 If you listened in to our Q & A last week (check out our Instagram story highlights), beautiful rooms drenched in black -- and in emerald green and in navy -- are right on trend. Generally, our clients are nervous to jump for a hue so dark because they think it will make a room feel small, but it's really quite the opposite. Here's our tips for taking a space dark. Study your light source before making a decision on a black or moody paint. If you have a tiny space with no windows, dark paint isn't a good option. But if you have enough natural light coming in, don't be afraid to go dark! Think: wall of windows and gorgeous black walls! Don't be afraid to take the dark color to the ceiling, the doors, the molding -- do it all! That's the secret that makes the space feel bigger. Opposite of what you would think, painting the trim and ceiling gives a seamless cohesion because your eyes don't break up the space with bright white trim. Before you buy a couple gallons of paint (or hire a painter), grab samples of the shades you're drawn to. Paint stores offer samples for $5-$10, and painting a section or two on different walls gives the opportunity to walk by them for a few days and see the colors in different light. Our go-to navy is Hague Blue (what Kell used in her room), a rich and dramatic blue that's also timeless. We adore Hale Navy for kitchen islands or cabinets dark blue. We always love a good black and Farrow & Ball's Pitch Black is a true, clean black -- as is Tricorn Black. If you're willing to jump for an emerald color, Studio Green is gorgeous.